Undertaking, signed by Ruggero Bacci, May 25, 1943. 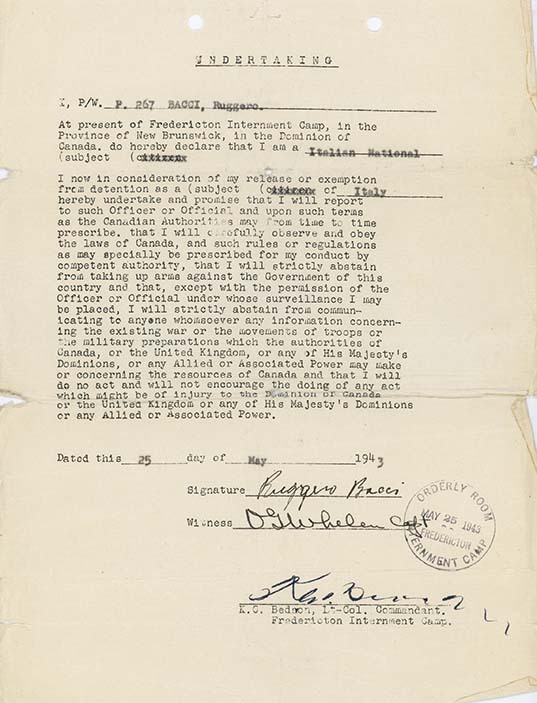 The document is also signed by the Lt-Col. Commandant, Fredericton Internment Camp. As a condition of release, most internees had to sign an undertaking, which served as a sworn declaration. As in this case, many were standard forms, with set conditions. I now in consideration of my release or exemption / from detention as a (subject ([strike-out] of Italy / hereby undertake and promise that I will report / to such Officer or Official and upon such terms / as the Canadian Authorities may from time to time / prescribe. that I will carefully observe and obey / the laws of Canada, and such rules or regulations / as many specially be prescribed for my conduct by / competent authority, that I will strictly abstain / from taking up arms against the Government of this / country and that, except with the permission of the / Officer or Official under whose surveillance I may / be placed, I will strictly abstain from commun- / icating to anyone whomsoever any information concern- / ing the existing war or the movement of troops or / the military preparations which the authorities of / Canada, or the United Kingdom, or any of His Majesty's / Dominions, or any Allied or Associated Power may make / or concerning the resources of Canada and that I will / do no act and will not encourage the doing of any act / which might be of injury to the Dominion of Canada / or the United Kingdom or any of His Majesty's Dominions / or any Allied or Associated Power.